Is your business open late in a downtown Kissimmee area, strip mall, or other commercial district? Illuminated signs are a great way to improve business. As winter approaches, darkness is coming earlier but that doesn’t mean that people stop shopping. Is your store illuminated properly to attract evening foot traffic and customers? 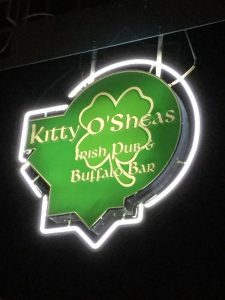 Whether you are a retail store, service, or restaurant in Kissimmee or the Orlando area, illuminated exterior signs are a multifaceted solution to your late-night business needs. By installing updated signage that works day and night, you will increase your business’ foot traffic and contribute to improving how the area around your business looks and feels to your customers. If you know illuminated signs are right for you, get a free quote from us today. What can illuminated signs do for you? Let customers know you’re open. You can be the beacon in the dark shopping area or office plaza. Whether you are simply open after dusk so that you can drive more sales for your products, or you specialize in late night dining and drinks, a well-crafted illuminated sign will act as a beacon and immediately signify that you are open to passers-by. You would be surprised how easy it is to accidentally appear closed to your potential customers at night. Some businesses leave interior lights on after they close up, and you don’t want people to dismiss your business because they aren’t certain whether you’re open or not. Welcome your customers and clients after dusk with brightly illuminated, inviting signage and interior lights. They will appreciate the fact that you cover every detail when planning your storefront signage. Increase foot traffic by emphasizing safety. People are far more likely to step into your place of business after dusk when they feel safe. Illuminated signs and other lighting offer a sense of added security, which can increase the number of shoppers walking by your storefront. If your business is at the end of a well-lit stretch of shops, customers might easily turn around before they even have the chance to see you are open. Show that you consider your shoppers’ sense of safety. Illuminated signage will keep customers walking toward your store when you stay open late. Add to your visual design appeal. Don’t let the hard work you and your designers put into your branding disappear in the dark. When dusk arrives, turn on your illuminated sign and impress your customers with your unified branding and bold style. Illuminated signs don’t simply serve utilitarian purposes; they also give you another chance to stand out against the competition. An expertly lit sign shows added professionalism. When you show customers that you have thought through every detail, including visibility after dusk, they will trust your business even more. When you care for your business, so will your customers. For more ideas on exterior signage and what kinds of illuminated signs will work for your business, take a look at our exterior sign project gallery. If you are ready to think about our illuminated exterior signs, get a free quote right now!